Union County, Florida could be in trouble. 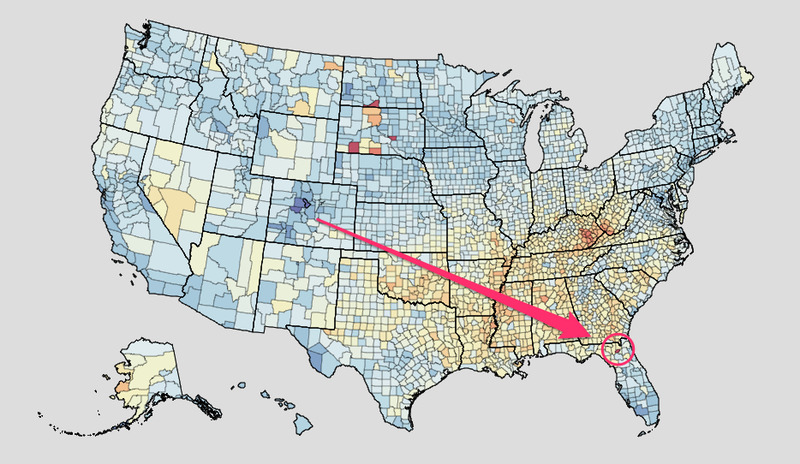 Located about an hour southwest of Jacksonville, the county of roughly 15,000 people is the least healthy in the United States, ranking at or near the top of numerous causes of death. According to 2014 data from the Institutes for Health Metrics and Evaluation, Union County leads the US in deaths due to cancers, HIV/AIDS and tuberculosis, malignant skin melanoma, and non-melanoma skin cancer. It also has the highest death rate overall and the second-lowest life expectancy, at just 67.57 years. The national average in 2014 was 78.74 years. Above: Annual death rates by US county, with lower rates in blue and higher rates in red. Joe Pietrangelo, health officer at Union County's department of health, has said the department's lack of funding consistently prevents it from offering people the services it needs. These include things like counselling, support, and information people can use to improve their health. It could explain why Union County has the second-highest smoking rate in the state, at 20.9 percent. The last time the US smoking rate was that high was in 2005. Without a concerted effort to help people make smarter, more health-conscious choices, people like Pietrangelo face an uphill battle to turn Union County around. Many people don't have the means to help themselves. Roughly 20 percent of Union County lives in poverty, compared to the national average of 14 percent. And the median income is US$39,163, while the national average is US$59,039. Union County's profile as an older, poorer region makes it a good case study for the health effects of living near the poverty line. The World Health Organisation has repeatedly found that health and income are inextricably linked, as a lack of resources to care for oneself and the presence of stress put an extraordinary burden on people's mental and physical wellbeing. Union County fits into this mould because there are three main employers across the 12 towns: the school system, the prison, and a local saw mill, WUFT reports. Short of starting their own businesses, people don't have the same kinds of opportunity to become upwardly mobile as those in more vibrant towns. Careers begin to stagnate, or disappear altogether. There's one piece of data that may offer a way out for Union County: A third of its population consists of inmates in the state prison. Researchers haven't been able to confirm the extent to which inmates are skewing the overall death rates, but they have acknowledged there is an effect. The county may not be as doomed as the data lead on. "Our guess is that prisoners throughout Florida with cancer are likely to be relocated to this centre, which in turn is (at least partially) driving the abnormally high cancer mortality rates in Union," Laura Dwyer-Lindgren, a researcher at IHME, told a local CBS affiliate in Jacksonville. "It's also worth noting that certain conditions (HIV, hepatitis) are also just generally more common among prison populations, which is part of why Union has such high overall mortality rates, totally apart from this hospital." Pietrangelo also speculated that as Union County's median age falls, more and more teens will help curb rates of smoking and, subsequently, fatal lung cancer. With a greater call for public health, his county could finally see the funding it's considered long overdue. In the meantime, Pietrangelo will continue to push for more money in an effort to help a crop of people that struggles to help themselves.